Beautiful! Very safe and relaxing. Great breakfast and vibe. Helpful staff that makes it all easy. 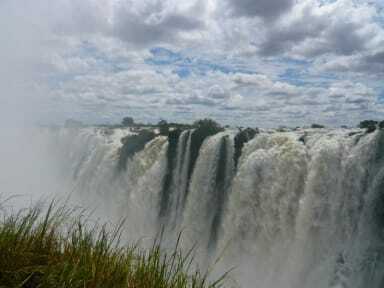 All around great place from which to base your Vic Falls activities. In the past wifi was spotty but that has been upgraded and is working very well now. Common kitchen has also seen some upgrades. Fran the manager was great in helping us plan our outings. We had originally reserved a safari overnight in Chobe Natl Park but had to cancel because the visa for our Congolese friend did not arrive in time but then it did come a day late. She phoned around and rearranged everything. Great job! Very cool hostel with a gorgeous garden. The food at the restaurant is delicious and prices are very reasonable, especially when comparing it to Vic Falls across the border. Activities can be booked at regular rates, the hostel doesn't take a commission. The rooms & baths were clean, but it does get hot inside since there is no AC, only fans. I would definitely stay here again! Great location, staff, free airport transfer and afternoon pancakes. This is a great way to meet other travelers and share tips. We had a great night by the fire, by the pool, and having a bbq. Thanks also for the tours booked through Fawlty Towers, they were also great value and we were extremely well looked after. Fawlty Towers is definitely the cheapest option for a hostel in Livingstone, and a great option at that! Clean rooms, a nice pool area, free pancakes in the afternoon, and an incredibly central location. A bit loud at night due to a nearby nightclub, and it didn't seem to have enough space to lock up backpacks, etc., in the dorm room. But I'd highly recommend. Great Hostel! Friendly staff! Central Location! Value for money! 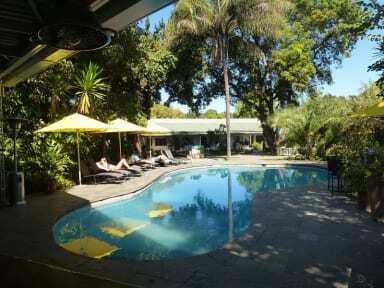 Pool, complimentary pancakes at 3 pm and access to self catering kitchen! We enjoyed our stay at Fawlty. Location was convenient, markets-eateries-curios all were close. They connected us to activities vendors effortlessly. I loved their swimming pool [non-swimmers may find it deep] and we used their free drop service. Useful community kitchen, and friendly staff. Altogether a nice exp. Con: They recommended a really bad bus co from LVI - LUN, staff said it would have ac/internet/toilet - it just had a toilet, ac was broken/no wifi. Plz dont recommend Roadlink. For the price I paid($40) I expected more. The room was much too small and hot. There was no aircon, just a fan which didn’t do much to cool things down. Nice atmosphere and good location. However I’m not sure if everyone else met different staff, but we found them to be quite blunt with us and didn’t seem happy at all. Security at front gate was good, but lockers in my dorm were made of crumbling, rotted wood and were too dirty inside to use. It was not possible to lock the door of the dorm room, as we were four separate travelers and there was only a single key. Bar did not have ice or white wine. Took over 30 minutes to connect to wi-fi initially; after that it was slow. There was a 2-3 hour power outage. Few outlets, one with dangerously exposed wiring. Pool and hostel cats were very nice.